Spooky Halloween White Sangria | Kitchenpants! Sangria is Spain’s way of getting you drunk on the cheap. And this recipe is my way of testing your patience. The grapes in this sangria look really cool, but they are a beating to create so make them before you put the sangria together. Otherwise, you (and every adult within earshot of you) might drink all of the sangria to deal with the arduous process of peeling and paring. No joke. Knives and Cutting Board – Use a paring knife for the grapes. One Bottle of White Wine – You can use whatever you prefer. I use an inexpensive (but still quality) Spanish table wine. Dry and fruity is best. 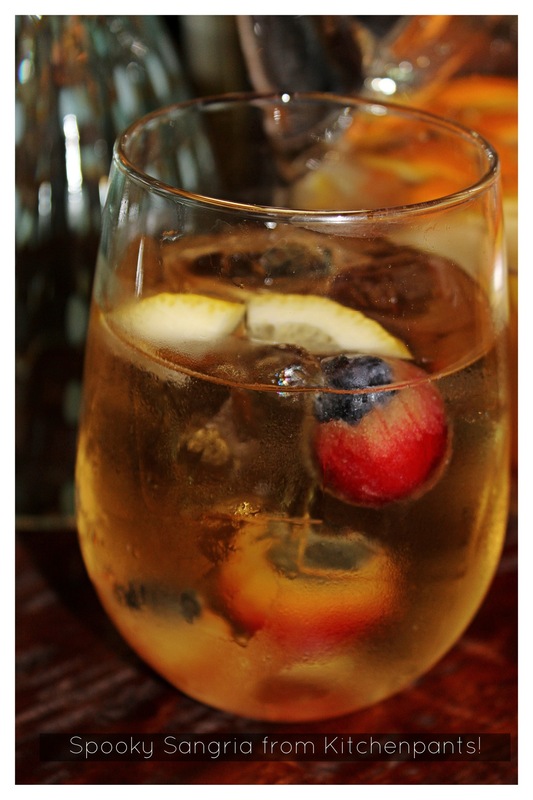 1/4 Cup Orange Honey – Use less if you prefer a drier sangria. 1 Can San Pellegrino Aranciata – This is Italian orange soda. 1 Apple – Granny Smith is the standard because these are tart. You will need one of each of the ingredients below for each eyeball. To make each eyeball, start at the hole on the top of the grape where it was attached to the vine. With your fingers, peel away the red skin about halfway back to expose the flesh. Keep some of the skin at the back of the grape. Using a small paring knife, cut a hole out of the top of the grape (so you are essentially cutting away the stem hole and some of the area around it). Find a blueberry that will nestle into the hole with the top of the blueberry facing out (it will look like an iris). You might have to use your knife to cut a little more space from the grape to force a fit. Break off part of the toothpick and push it through the blueberry “iris” to secure the blueberry. Store the collection of eyeballs in the freezer until you are ready to use them in the sangria. You can make them a few days ahead of time…and I recommend this. Mix the wine together with the orange liqueur and San Pellegrino Aranciata. Add the honey to the mixture. Slice up the fruit as you wish. Bear in mind that the grapes are not especially buoyant, so slicing fruit a bit larger might be the best way to go. Let the mixture steep in the refrigerator for a bit so that the flavors can blend. You have a few choices here. If you are the type to pour your sangria into a pitcher with ice and serve from there, you can do so and add the eyeballs to the pitcher. If you are like me and you don’t add ice to the pitcher, you can add the eyeballs to your glasses when you add ice and serve.